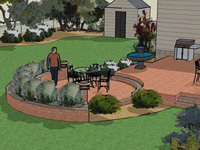 Landscape Design Advice - What's New? 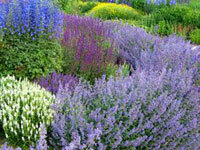 What's New At Landscape Design Advice? 1. I spent two weeks in Italy at a villa in Tuscany end of September/beginning of October! It was heaven. You can see my favorite photos here. 2. From the questions I receive on my website, I would say that my visitors are half DIY's (do-it-yourselfers) and half hire contractors to do the work. Some do both. 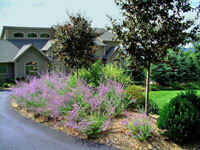 I realize that it's difficult to find good landscape contractors, even where to start. I happen to like companies that offer many different services for my clients. It just makes life easier. You don't have to hire different contractors to do differen things such as hardscape or plantings and you don't have the hassle of coordinating them. I have been acquring a list of contractors throughout the U.S. The list is by state and sometimes area of a state. Although I can't possibly know them personally, I have looked at their websites and they appear professional. There are almost no lawn maintenance companies and very few design only companies. They specialize in hardscape and plantings. You can find them on my site near the top of the navigation bar and it's titled Find a Landscaper. 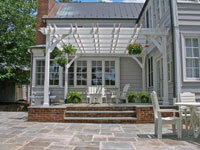 So, if you are looking for a company to install all or part of your project, you just might take a look here. 3. There are some other new pages on my site. Lawn Grass Seed - learn about the best types of grass seed to use. Issues With Trex Decking - What to do about moldy areas on trex decking. Asphalt Driveways and Sealing - Installing an asphalt driveway and sealing it. Asphalt Driveway Sealing Tips - Tips for sealing driveways and make them last for a long time. 4. Please be aware of my other websites and blog. Digital Photos Online - This is a comprehensive site on working with your photos. Editing programs, sharing, storing, emailing, printing and backups are just a few topics covered. 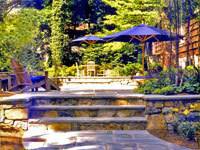 Susan Schlenger Landscape Design - My personal, local website! 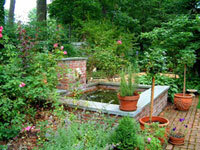 Landscape Design Viewpoint - My blog about anything. I wish you all a happy Thanksgiving! Thanks for subscribing to my newsletter.